Where does it all go? Everybody is so busy over the Christmas period, celebrating and visiting friends and family that often recycling is the last thing on their minds. 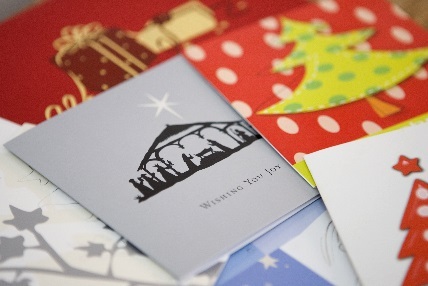 Did you know that every year at Christmas, the UK uses around 300,000 tonnes of card packaging? That’s enough to make a cardboard motorway stretching from Birmingham to Lapland and back 110 times! That’s JUST card – think about everything else you might throw away over the festive period! 1. Scrunch up any wrapping paper you get – if it springs back then it cannot be recycled and needs to go into your non-recycling bin. If it holds its shape (like a newspaper would) then it can be recycled in your household recycling container. 2. Remove any buttons, bows, sequins, glitter etc from cards and wrapping paper before you put them into your recycling bin. Consider whether you could re-use them at home and if not they will need to go into your non-recycling bin. 3. Don’t forget about batteries – remove any batteries from Christmas cards before you put the cards into your recycling bin. Any batteries that you need to throw away can be taken to your local household recycling centre. 4. Consider using re-usable packaging for gifts – gift bags can be used over and over again and you could even use this years Christmas cards to make pretty gift tags for next year! 5. Real Christmas trees can be taken to your local Household Recycling Centre for recycling along with the foliage from real wreaths! 6. Christmas decorations can’t go into your recycling bin – see if a local charity shop wants them or upcycle them. Otherwise these will need to go into your non-recycling bin. 7. Remember – any electricals will need to go to your local Household Recycling Centre to be recycled. They cannot go into your household recycling bin. 8. Plastic sweet tubs and metal biscuit tins are ideal for recycling – just make sure they’re empty of any sweets or pesky wrappers and put them into your recycling bin. 9. Polystyrene, plastic films and black plastic cannot be recycled so separate these out and put them into your non-recycling bin. 10. Foil cannot go into your recycling bin at home but you could clean out your mince pie cases and take them up to your local Household Recycling Centre when you next visit. 11. You can put any colour glass bottle or jar into your recycling bin at home. 12. You can even leave the lids on your plastic bottles – just be sure to not tighten them too much. 13. Lots of fruit juice over Christmas and New Year? Juice cartons are perfect for your recycling bin! 15. Ready to get rid of that old Christmas jumper? Consider whether you could repair it and, if not, take it to a clothing bank – textiles shouldn’t go into your recycling bin at home. The most important thing to remember is to rinse any recycling before you put it into your recycling bin. Squash any cardboard boxes. Don’t worry about squashing plastic bottles or cans. Make sure you tip your recycling into your recycling bin loose – we don’t want any bags please. Things that can be recycled at home in Herefordshire and Worcestershire: Cardboard; card; paper; aluminium cans; steel cans; plastic bottles, tubs and containers; cartons; glass bottles and jars. Remember, all the Household Recycling Centres are closed Christmas Day, Boxing Day and New Years Day. On Tuesday 27th December and Monday 2nd January all sites that are normally open on these days (except Hallow Road) will still be open – under normal hours. From all of us at Severn Waste Services we wish you a very merry Christmas and a happy New Year.